we also says that “atoms are very small particles which made matter” so atom is fundamental unit of atom. According to this theory atom cannot be divided, but after some years it is proved that atom can be divided further by many scientists like J.J.Thomson, L.Rutherford, N.Bohr, Chadwick etc. Sir J.J.Thomson and W.Crooks did many experiments with discharge tube for the discovery of electron. 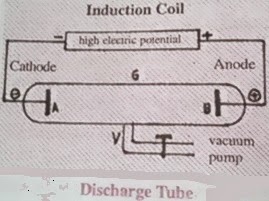 Discharge tube have tube like shape made from glass with two electrodes (Cathode -ve and Anode +ve) in vacuum created by vacuum pump connected to discharge tube. High electric potential is applied between two electrodes. Air is bad conductor of electricity so vacuum pump is connected to reduce pressure to 0.02mm inside discharge tube currents starts flowing between electrodes and light is emitted. On further reducing pressure in discharge tube greenish yellow color fluorescence occur. As these rays emerging from cathode, Sir J.J.Thomson named them as cathode rays. Deflection of cathode rays towards positively charged plate in electric field proves that these rays carry negatively charged particles. These negatively charged particles are named as electrons. 1. Cathode rays always travel in straight line. 2. Velocity of cathode rays and velocity of light are approximately equal. 3. On applying electric field in the path of cathode rays, cathode rays turn towards +vely charged plate that proves cathode rays are made up from negatively charged particles. 4. Cathode rays rotate light wheel placed in their path that proves cathode rays are made from particles having mass. 5. Cathode rays pass through thin metal foil and it gets slightly heated up by action. 6. These rays produce fluorescence at walls of glass tube. 7. Cathode rays ionize gases and also affect photographic plate. 8. When these rays strike any metal with high melting point (like tungsten W) they produces X-Rays. X-rays are electromagnetic radiation , X-rays was discovered by W.K.Roentgen in 1895. X-rays are also known as Roentgen rays. Why X-rays are used in medical sciences? X-rays are used in medical sciences because x-rays have high penetrating power. J.J.Thomson conduct many experiments that charge to mass ratio of an electron remains same, irrespective of nature of gas and nature of cathode electrode material. Millikan’s Oil Drop Experiment or Determination of charge of electron is conduct by an American Scientist R.A.Millikan, who perform an experiment on the charge on oil drops. R.A.Millikan perform several experiments to calculate charge on oil drops and he gets every time its value equal to -1.6×10-19 coulomb.When these results associated with results of cathode rays then conclude that charge present on particle of cathode rays is -1.6×10-19 coulomb. Mass of an electron is 1/1837 th the mass of a hydrogen atom.